Personal Scrapper posted 15 great challenges for an online crop. I'm not one to turn down a challenge...so I completed them all. 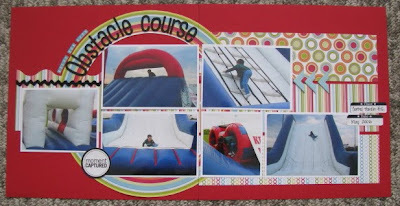 The first six layouts that I'm sharing with you were all made with the August kit from PS and coordinating products. "The Line Drive Stops Here" is my new favorite layout. (I say that frequently, huh?) These photos were taken a couple weeks ago when Blake was FINALLY given a chance to play 3rd base in an all-star tournament. He did great - stopped a line drive. 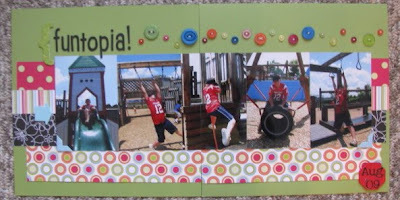 This LO was for a "summer fun" challenge to scrap a summer memory. Every crop has a "scraplift the design team" challenge. I took a single page LO by Carrie Postma and stretched it into a 2-pager. Pretty much the only common ingredient was the placement of the patterned papers. One of my goals for the crop was to try to scrap some older photos instead of just grabbing the last batch I had printed. 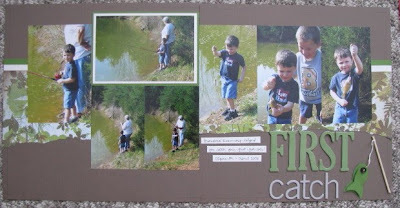 I pulled out these photos from 2006 to use for the "something new & something old" challenge. 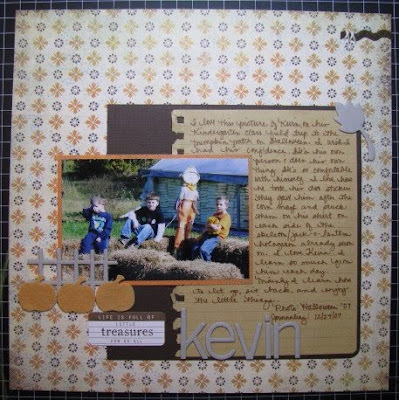 I used my new kit and for the old items used some Navy embellishments and the blue tag. This LO is special because it documents a close family friend visiting with us. "U Did It!" captured the exact moment I told Kevin he made the 7 year old all-star team. (Us scrapbookers think ahead!) Since Kevin had dreamed of being an all-star since Blake first made the team three years ago, I thought it was fitting for the "dream" challenge. I was inspired by a sketch by Scrappin' Day. 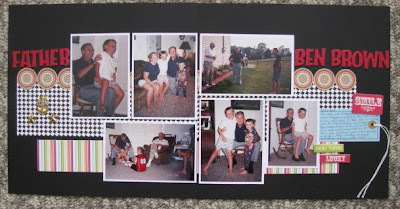 There was a "recipe" challenge to make a 2-page LO with 4-6 photos and orange somewhere on the layout. I pulled out some pics from the Relay for Life in '06 for Kevin's album. I LOVE THIS PAGE! I often find that I'll pull song titles to use for my page titles, so I was looking forward to doing the "MTV Rocks" challenge with music inspiration. I took it a step further and scrapped about a song that was part of our personal soundtrack last summer. I've been a Weezer fan for years and last summer bought their new CD (I rarely buy CDs). 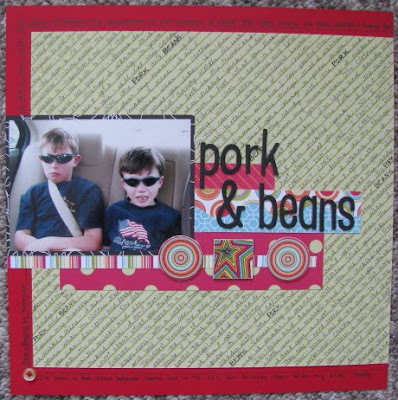 A favorite song of mine was "Pork & Beans" (watch the video here). I played it so much that the boys even knew all the lyrics. Tom HATED the song and we drove him crazy by singing it so much. (Good times!) I ended up writing the lyrics of the song out for the background of my page. We got our dog, Scout, from the pound in April 2006, but I never scrapped it for Kevin. It fit under the "what's in a name" challenge since I explained that Scout Radley was named after two characters in my favorite book, To Kill A Mockingbird. Since this was a birthday crop, there had to be a "birthday" challenge! 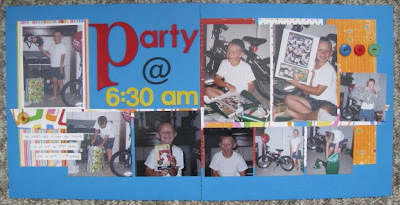 I pulled pics from Blake's 7th birthday (he'll turn 11 in October!). Yes, we had to open his present at 6:30 in the morning before Tom went to work. Blake has no patience. I have no idea where that comes from! I pulled out my PS kit from September '07 for the "use your oldest PS kit" challenge. I had actually purchased two of these kits that included the Basic Grey Mellow line since I liked it so well. The photo is from Halloween '07 when Kevin's Kindergarten class went on a field trip to the pumpkin patch. Luckily I had jotted down my thoughts of the photo (not the event) when I filed the pic away. I just had to rewrite my journaling on the page. I was determined to use up that old kit while I had it out. In total, I made six layouts (including the next five) with it. I thought the "Scenery" challenge would be hard until I came across the photos I took of my parents' farm last summer. I kept it simple. Sometimes simple is good. 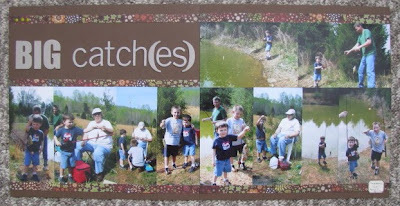 I don't know how many times I've pulled out photos of our fishing trip with my mother-in-law in Tennessee in April '06. I realized they went great with the Mellow line of papers. 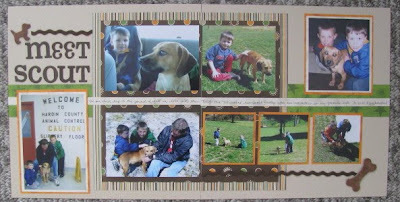 I took the stack of 24 photos, the kit and some additional naked chipboard and made the following three layouts. I am really happy with them all. This one is for a "list" challenge. 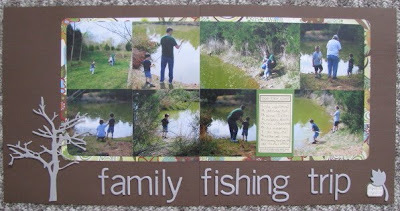 I got a little creative with this page and made my own fish embellishment. The fishing pole is a piece of a skewer that I cut down. 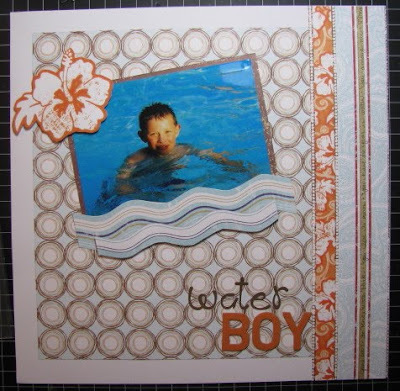 I handcut to "fish" and layered them, raising the top layer up with pop dots. I finished it off with a button eye. In total there are 35 items on this page for the "35 item" challenge. This LO came together really quick for the "Speedy Gonzales (in under 20 minutes)" challenge. Thanksgiving is a holiday that I never manage to capture photos for. I guess I'm too busy eating??? I had these pics of the boys and my nephew dancing in the yard. 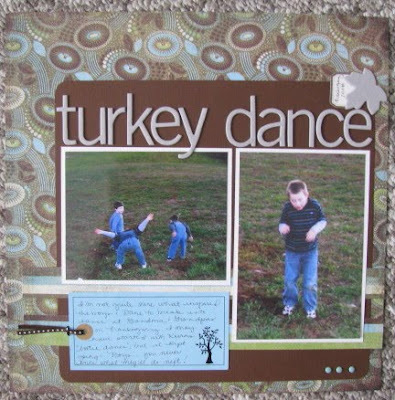 I'm not sure if it was called a turkey dance at the time, but the title fit for the "holiday" challenge. The only challenge that really stumped me was the "Hawaii 5-0" challenge to do something tropical. I finally found this shot of Blake in '07. I used some older papers that I must have been saving for this page. I kept it really simple - just three patterned papers (one double sided) and two alphas. I had cut a few things and used pop dots for dimension. So, there you have what I've been up to since last Tuesday when I've had free time. The crop isn't over yet, and I still have some ideas. I may complete a few more. 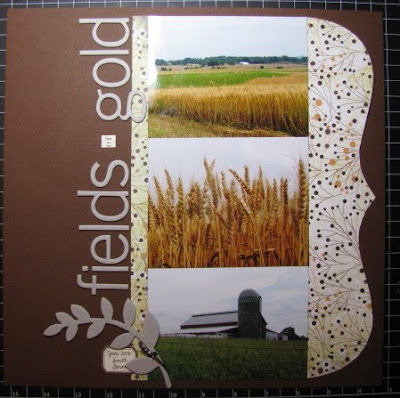 Ok, I was going to say what my fav layout was but as I scrolled down I kept changing my mind, each one is as good as the rest, can't pick one but I love the Fields of Gold, You did it and Obstacle Course! You really rocked this crop girl! Way to go!